I am sure you have all either been to N2 Extreme Gelato (43/1 Dixon St Sydney, NSW 2000) or at least heard of it. N2 is that gelato store in Chinatown that makes gelato with liquid nitrogen – Heston Blumenthal style! Coming to N2 is as much for the spectacle as it is for the gelato itself. Once you choose your flavour from the blackboard, you will get to witness the gelato being churned right before your eyes. The store assistant, dressed in lab coat and all like a scientist, will take one of the large beakers filled with colourful mixtures and pour it into a KitchenAid mixer. Combine with liquid nitrogen and blitz for a couple of minutes and you have freshly churned gelato. There are a lot of flavours to choose from, ranging from classic flavours such as caramel, to crazy ones such as Chinese cough syrup and Vegemite. All the flavours that have been sold in the store are listed on another board under ‘Flavour Archive’. I have been quite to N2 quite a number of times so have tried quite a few different flavours. The flavours are a bit hit and miss and not as good as what you can find at other gelato stores such as Gelato Messina or Cow and the Moon Artisan Gelato. The great things about the gelato at N2 is that you know that it’s fresh, the gelato is creamy, it’s smooth and the flavours taste natural. The black salt works very well with the caramel but there just is not enough of it to go around. One scoop of gelato here is actually quite large and best shared between 2 people. I prefer salted caramels where the salt is infused into the caramel rather than sprinkled on top. Also, I actually found the gelato too creamy. As I ate more and more of the gelato, I thought I was starting to taste banana, probably due to residual flavour left over from a previous order. I would have liked the gelato more if they washed their equipment more thoroughly. Overall, the black salt caramel was a good gelato but not spectacular by any means. 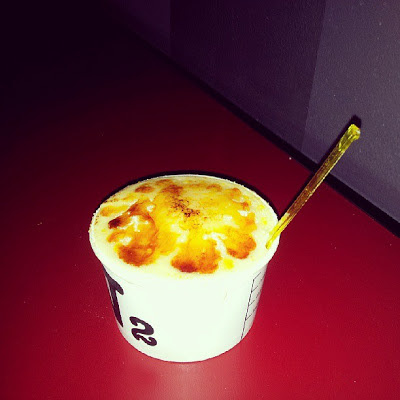 Crème brulee as a gelato is a really cool idea. Basically it is a custard gelato with a layer of burnt sugar on top. I really enjoyed the flavour of the gelato. It was smooth and creamy and tasted just like a good custard. I am a little sceptical of the brulee component of the gelato despite the novelty of a crème brulee gelato. Because the brulee is made by applying a blow torch over sugar coated on top of the gelato, the top part of the gelato became quite melted. Also the sugar itself was quite thick to make sure the gelato doesn’t become too melted due to the direct heat being applied. Overall, this was an enjoyable gelato flavour that I would be happy to order again. Lowlight: Some of the flavours I have had just don’t work very well. E.g. I had a flavour called Geisha’s juice, which was a green tea and mixed pepper sorbet that I just didn’t enjoy very much.